Service Ministries Chair, Joan Derle, has restyled the stoles made by the National Altar Guild Association for our chaplains in the Armed Forces. 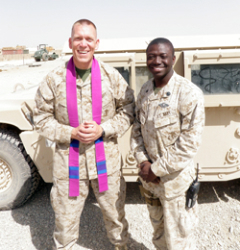 Chaplain David Duprey received a set of these newly styled stoles while in Afghanistan and shared some of his thoughts. The redesign was done in accordance with the office of the Rt. Rev. George E. Packard, Bishop Suffragan for Chaplaincies, and the Rev. Gerald J. Blackburn, Director of Federal Chaplaincies and Executive Officer to Bishop Packard. Small enough to fit into a pocket and be ready when needed, the new stoles have modern, up-to-date designs in keeping with our young service men and women. Each chaplain receives two reversible stoles made in the liturgical colors of white, purple, red and green with appropriately colored orphreys. An example is the purple stole with shades of blue orphreys, as purple and blue are used during Advent. The face fabric is raw silk noil, the orphreys are simple grosgrain ribbon, and the stoles no longer have the traditional fringe or a cross at the center back neck. Stole size is small for convenience and portability. Each measures two and one half inches in width and eighty inches in length. “This is a wonderful ministry. 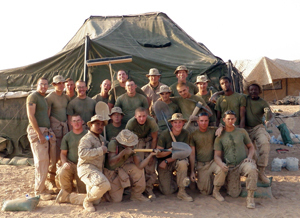 It gives us the opportunity to share our God-given gift of sewing, and allows us to offer tangible support to our chaplains and the men and women of our Armed Forces who day after day put their lives on the line for us.” Joan said. “The set of stoles, given as a gift through Bishop George Packard, Bishop Suffragan for Federal Ministries, was a complete surprise. The handwritten note from him, meant to me that the church had come to visit. “The size and texture of the stole set is perfect; small enough to carry all of the church seasons of colors in any setting. They are very tastefully done, plain enough for this very plain setting, and yet with rich and vibrant color. The fact that they were handmade and that the artist, Joan Derle, included a card with her name, allowed me to feel the connection with the artist and be able to respond to her. “We are isolated out here, not only from the larger body of believers in Christ, but also from our own mother church. Those stoles were a tether for me, on that day and since, to rebind me to the color and texture and richness that the church represents. I packed only a white stole with me, thinking burials and baptisms, but I was able to use that stole for a marriage vow renewal ceremony. “Your purple stole I have used during Lent and for two important ceremonies: a Dignified Transfer of Remains for two of our Marines killed in action, praying and escorting their bodies aboard a C-130 for transport home; and also to wear at a British Vigil ceremony, to stand with my colleague British Chaplains to mourn the loss of two of their fallen service members. “It would be too simple to say, ‘It was the thought that counted.’ It’s more like there was an entire sacristy of love contained in that small envelope, and it was a sustaining power at just the right time, to assure me that the church cared where I was, and that I would return to her soon enough. If you would like to participate in this ministry and share your gifts, please contact the Service Ministries Chair, Joan Derle at derlejoan@aol.com. Volunteers will receive a kit with all the makings for two stoles, including face fabric, interfacing, orphreys, thread and detailed instructions.